BBC NEWS | UK | Can talking to plants bear fruit? Much-derided claims that talking to plants can help them grow are being tested in a serious study at the Royal Horticultural Society's (RHS) gardens. For 30 days tomato plants at Wisley in Surrey will "listen" to voices through MP3 headphones attached to their pots. Growth will be measured before, during and after the experiment and compared to "control plants" left in silence. Wisley gardener Colin Crosbie says there is "solid evidence" certain sounds encourage healthy growth. "We're taking it very seriously. A lot of people are thinking this is an April Fool but it's quite serious," he told the BBC. "We want to get a great diversity of voices. There's great variation in the human voice, and there might just be the perfect voice for talking to plants. 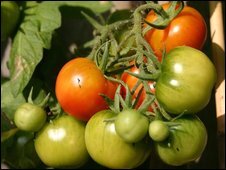 As far as the tomatoes (Gardener's Delight) are concerned, he went on: "We've tried to pick a variety that will grow at an even rate. "We're having fun too, but it could be very beneficial." On Wednesday the RHS will hold auditions to try to find "the voice of Wisley" and Britain's most plant-friendly human sound. The recordings are expected to include poems, stories, nursery rhymes, songs, Shakespearean verses and even extracts from John Wyndham's novel The Day of the Triffids. Mr Crosbie said: "We know that sounds of between 125hz and 250Hz can affect gene expression in plants and help them grow but this has only been tested using music. "For the first time we will be able to advise people not only whether it's worth talking to their plants but exactly how it should be done. "We may even be able to standardise the practice by recording the perfect voice for those less confident in conversing with their plants." Toby Buckland, lead presenter on BBC Gardeners' World, said: "A lot of thinking behind this is that if a gardener is relaxed, it helps the plants grow better. "Plants do pick up on your stress, that's something that's well known, and if you're not confident, it's as if it's a self-fulfilling prophecy for failure. "As soon as you're relaxed, it comes together. It's well worth looking into and I'd be interested to see the results." 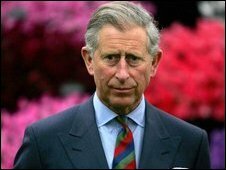 In a television interview in 1986, Prince Charles famously said it was "very important" to talk to plants and that they "respond" when spoken to. His views were ridiculed by many commentators but are shared by Mr Crosbie. "I do believe talking to plants works. Gardeners are quite tactile and there are those of us that talk to our plants to actively encourage them," he said. "There are many examples where plants have been threatened when not performing, 'right, if you don't do it, this will be the chop for you', and they tend to respond." In 2007 South Korean scientist Mi-Jeong Jeong claimed playing Beethoven's Moonlight Sonata to rice plants encouraged quicker growth and blossoms to bloom earlier. The RHS is Britain's leading gardening charity dedicated to advancing horticulture.